We are strictly controlled by our planning permission and we ask that everyone adheres to this, particularly so that our neighbours are not disturbed out of hours. Closed Saturday afternoon and all day Sunday. We are open during normal opening times every day including bank holidays with the exception of Christmas Day and Boxing Day. 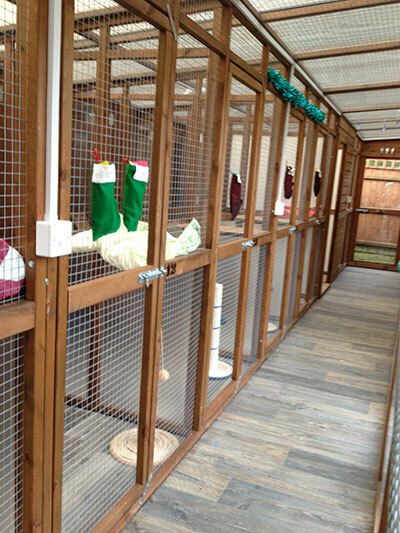 Pets arriving for their Christmas break need to be delivered during the last open hours before Christmas ie if Christmas Day falls on a Monday Puss needs to be delivered to us by Saturday 23rd between 10 and 12noon. All bookings received prior to 1st July 2019, even if the booking is after this date will be charged at the current rate. Prices are for each day that your cat is with us including delivery and collection day. Cats from the same household can share one pen and we have two pens that can accommodate up to four cats from the same household. Prices for more than one month at a time can be negotiated. Prices for more than 4 cats at a time will be priced on booking.